Beautifully engraved certificate from Verado Holdings, Inc. issued in 2001. This historic document was printed by the Security-Columbian United States Banknote Company and has an ornate border around it with a vignette of the company's logo. This item has the printed signatures of the Company’s President, and Secretary, and is over 10 years old. Summary: According to a Press Release dated October 31, 2001, a complaint was filed alleging violations of Sections 11, 12(a)(2) and 15 of the Securities Act of 1933 and Section 10(b) of the Securities Exchange Act of 1934 and Rule 10b-5 promulgated thereunder. 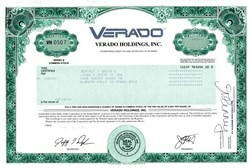 On or about March 8, 2000, Verado commenced an initial public offering of 10,000,000 of its shares of common stock at an offering price of $17 per share (the 'Verado IPO'). In connection therewith, Verado filed a registration statement, which incorporated a prospectus (the 'Prospectus'), with the SEC. The complaint further alleges that the Prospectus was materially false and misleading because it failed to disclose, among other things, that: (i) the Underwriters on the offering had solicited and received excessive and undisclosed commissions from certain investors in exchange for which those Underwriters allocated to those investors material portions of the restricted number of the Verado shares issued in connection with the Verado IPO; and (ii) the Underwriters had entered into agreements with customers whereby the Underwriters agreed to allocate Verado shares to those customers in the Verado IPO in exchange for which the customers agreed to purchase additional Verado shares in the aftermarket at pre-determined prices. Denver-based Verado (formerly FirstWorld Communications) apportions its energies across three areas: Internet services, data integration and consulting services, and telephony services. Using a combination of owned and managed facilities, the Company provides high-speed Internet access, Web hosting, e-commerce, data connectivity, systems integration, ASP services, and switch-based local and long distance services. The Company's Internet service offerings include high-speed Internet access, such as dedicated access and DSL and dial-up access. The Company stepped up its Internet service strategy early in 1999 through the acquisition of ISPs Slip.Net and Sirius Solutions, as well as a number of smaller ISPs during the rest of the year. The Company has been focusing its business plan on Internet services growth. On top of the five it already had, it put in new Internet Data Centers (IDCs) in Salt Lake City, Portland, Dallas, and Houston during 2000. More IDCs are planned and the Company provides data center service in Chicago through leased facilities. Verado had a total of approximately 245,000 square feet of space as of November 2000. The Company has installed Oracle’s iHost Internet platform and has achieved Cisco powered network status for its IDCs and hosting operations. Verado has partnered with Akamai to speed up Internet delivery, with Microsoft to develop ASP solutions, and with Onyx for its ASPiN program. In November 2000, the Company announced that it was selling off three non-core businesses with the aid of investment banker Daniels & Associates. The units to be sold off include Web integration, ISP and telephony (CLEC). All revenue from these units was being accounted for as discontinued operations. Verado was still shopping the operations as of late March 2001.